Abigail Smith Adams was born on November 11, 1744, in Weymouth, Massachusetts. She was descended, on her mother’s side, from the well-to-do Quincy family and was a cousin of Dorothy Quincy, who was John Hancock’s wife. Although girls at that time typically did not receive a formal education, Abigail’s mother taught Abigail and her sisters to read, write, and cipher; while they also studied English and French literature. In addition, Abigail obtained a considerable amount of education from her father’s teaching in the family’s large, private library. Her well-educated father was the minister of the North Parish Congregational Church of Weymouth. John Adams, a Harvard-educated country lawyer at the time, was quickly attracted to the shy seventeen-year-old who knew about poetry, philosophy, and politics, all of which were considered inappropriate reading for a woman at that time. On October 25, 1764, Abigail and John were married. 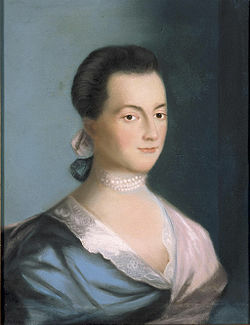 Abigail Adams gave birth to six children, three daughters and three sons, four of whom would live to adulthood. She was the first woman to be both wife of a president and mother of a president. John Adams traveled to France and the Netherlands during the American Revolution, in hopes of urging those countries to support the colonies. During his prolonged absences, Abigail remained at home teaching the children and also running the family farm. Although women at that time did not normally handle business affairs, Abigail traded livestock, hired help, bought land, oversaw construction, and supervised the planting and harvesting. Abigail’s childrearing included continual reminders of what the children owed to virtue and family tradition. Although Abigail and John were separated more often than they were together during this founding era, they shared their lives through letters addressed to “My Dearest Friend,” discussing current events while attending to the concerns of raising their children. A gifted writer, Abigail’s letters were unsurpassed by those of any other American woman at the time. When her husband was elected President, Abigail became one of the most erudite women ever to serve as First Lady. Abigail Adams was also a strong advocate of more opportunities for women, particularly in the field of education. She recognized the importance of children being taught by mothers who were not merely literate but students themselves and she purposed to speak out in favor of a girl’s education every chance she had. She believed that women should not submit to laws that weren’t made in their interest, nor should they be content with the simple role of being companions to their husbands. They should educate themselves and thus be recognized for their intellectual capabilities, so as to better guide and influence the lives of their children and husbands. The Quotable Abigail Adams , John P. Kaminski. My Dearest Friend: Letters of Abigail and John Adams , by Margaret A. Hogan and C. James Taylor. The Christian History of the American Revolution , by Verna M. Hall, Foundation for American Christian Education, San Francisco, 1976.